6.5 million stars, stunning views of the universe, and inner peace await at Yoga Under the Stars. While ordinary yoga practices focus on finding inner peace, Yoga Under the Stars brings an outward shift to the experience. 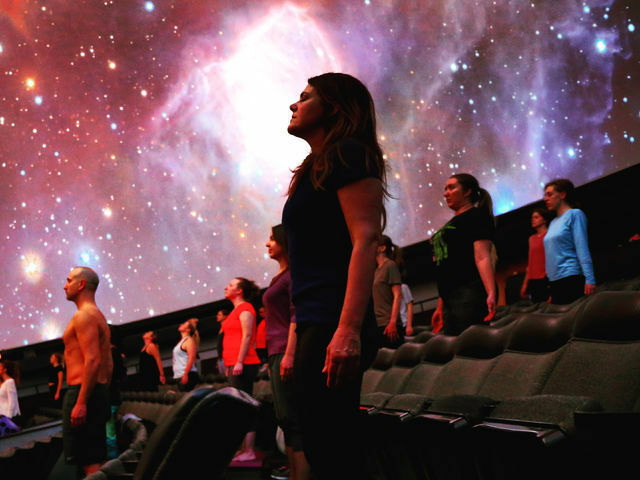 Immersive visuals displayed across Sudekum Planetarium’s magnificent 63-foot dome inspire thought on the scale of the universe and humanity’s place within it. Our sessions begin with breath work, continue with positions to elevate the heart, and end in savasana to relax the body and the mind. Darkness and 360-degree views of the stars may disorient some viewers. This adds a challenge to balancing. We recommend Yoga Under the Stars for intermediate yogis looking for a new, out-of-this-world experience.